It has been a tremendously long time but last we spoke, I hinted at the fact that I indeed got engaged (YAY!) and am in the midst of wedding planning. While I will not be speaking about any of my details until afterwards, I will share that my shopping for shoes has been RIDICULOUS! You see..I am super picky when it comes to Formal Shoes. I like style and I also like comfort. The fact that I will be standing around in these joints for HOURS.....means that my bridal shoe HAS TO BE on point. Touch Ups by Benjamin Walk "Fantasy"
This is when I thought were were going with a Peacock theme. But...oh well...total waste! 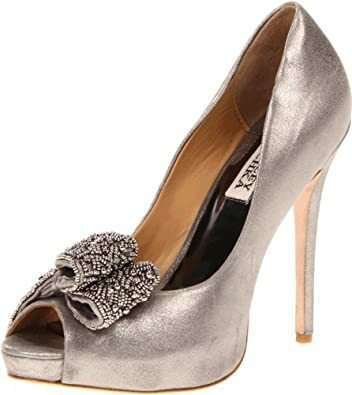 Cute and comfy and with a stylish Rhinestone and peacock detailing..this shoe by TouchUps wasn't even that expensive! Too bad it didn't work! So after we talked about the vision (he hated peacock)...I went searching on Amazon and found these beauties! I ended up returning them. At first, we were going to wear Gold shoes. But I didn't like these. This color wasn't "gold" at all and the heels were so skinny I didn't feel that stable. It was a gorgeous shoe with lots of padding in the foot-bed but.....eh. 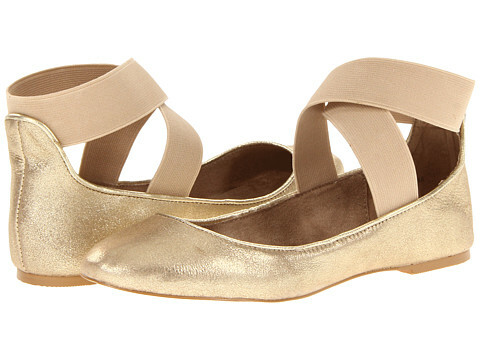 I LOVE the shiny gold tone to the shoes..but again...it felt so narrow. And the ankle straps were cutting of my cankle circulation. No Ma'am!! I ended up giving these to my little cousin so she could party in for her birthday! I am sure she enjoyed them. I loved the shoe. It was a mix of satin bow and leather shoe. I even purchased a jazzy shoe clip to add some sparkle. It seemed comfortable....at first. BLAH! Once again..my ankles were being suffocated. I realize now that ankle straps aren't my friends. I cannot wear them. And the leather made them seem so casual. 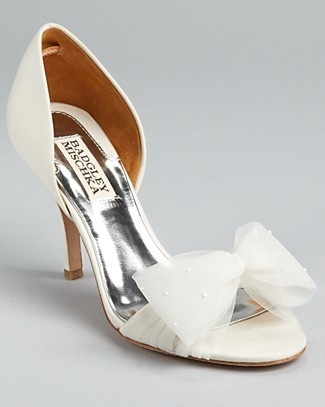 So...I decided to just say oh well......maybe I can just wear my flats I purchased..
Not to be deterred...I found a pair of Badgley Mischka's on MyGlassSlipper.com that didn't seem too high or too fancy. And were the cutest pair of d'Orsay pumps with a tulle bow w/ pearls on the bow...tiny pearls! So what was I gonna wear? Should I give up? Or just rock some bedazzled Converse?? But the answer came this weekend..on a fluke...I finally found my dream shoe. Actually..I fell in love with it a while ago browsing online at Dessy.com for Bridesmaids dresses. It had been sold OUT everywhere. I happened to be at David's Bridal Collection in Buckhead (Atlanta). I was purchasing a new slip and out the corner of my eye...I saw the shoes. I gasped! These joints had been sold out everywhere! DSW..Macy's..the Dessy site where I originally saw them. I couldn't believe David's had them! I really wanted them. I happened to ask the clerk if they had them in white (They had black, ivory/tan, and white on display). I figured they'd be sold out but I'd try my luck anyway. But be still my beating heart..the peppy little clerk at David's popped out the back and said "Here they are!!" 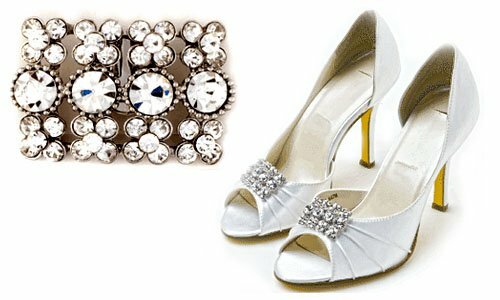 Rhinestone-embellished wedding shoes with bows, Retail $139. I got them for $115 at David's Bridal.I walked around and I felt like a total princess! My legs looked amazing. My ankles weren't hurting. They weren't too high...but I figured they would be high enough for my dramatic bottom of my dress. I was so giddy as I walked out the store with the shoes....but reality quickly set in: What on earth am I going to do w/ all these shoes I had?? So for those who are interested, all the above shoes (except the Pour la Victoire and the Platino BMs) are listed for Sale (along with a few other Bridal things such as slips and NBW corsets) on my Ebay site. Check it out and place a bid! I even threw in the shoe clips on the Ivanka Trumps!!! May my impulse purchases find a new home in your collection!! !